I love adding a unique twist to my convention games, and my Wild Talents game for Gateway 2012 was no exception. Months earlier I had been inspired to set my game in the world of Skyrim (mostly because I was playing it every waking moment), but I wanted to give my players a completely unique experience. A major role reversal was in order. 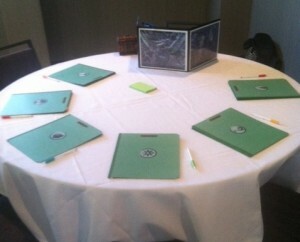 When my players arrived, they were greeted by my trademark gaming table. I’ve had other GMs scoff at my admittedly overdone layouts, but I find that players really appreciate the amount of preparation and it starts everything on a very positive note. Folders were laid out on the table, each one labeled with a symbol that represented the character that lay within. I never let players see the character sheets before a game, so these symbols were the only clue they had to choose their folder. I find that this forces players out of their usual go-to roles and really ends up stretching their creativity during the game. It also negates the show-up-early-to-get-the-best-character strategy. I gave a brief description of the setting, carefully avoiding giving away the big surprise I had in store for the players. 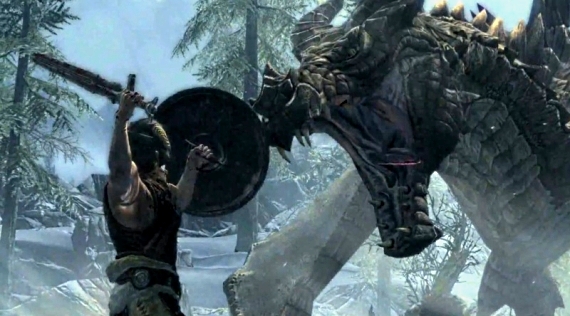 Skyrim is a typical fantasy setting with a bit of Viking flavor thrown in for good measure. Wizards and warriors are commonplace, and dragons are the enemy of mankind. Many of my players were very familiar with the video game and had a very set image of what they were expecting from this game. Boy, were they in for a big surprise! After my explanation, I let them open their folders to see the portraits of their characters. The reaction was amazing. 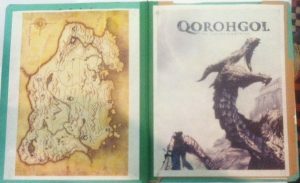 The players were shocked, delighted, and a little thrown by the dragons that greeted them when they opened the folders. 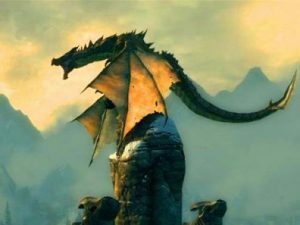 Each dragon had a unique “thu’um”, a magical phrase in the language of the dragons, that gave them thier powers and the dragon’s name was translated from Skyrim’s dragon language to reflect their powers. Fendufyn, “The Devouring Bane”, was the biggest of the dragons and had a thu’um that turned his skin to stone. Qorohgol, “The Raging Lightning”, had skin that became electric, and electricity is VERY dangerous in Wild Talents. Haslovaas, “Song of Health”, was the most intelligent of the dragons, and had the ability to turn ethereal and heal through his thu’ums. Strunduving, “Storm-wing Devourer”, was the smallest and fastest of the brethren, with a thu’um that gave him super speed. Yolvolun, “Fiery Night”, was another of the bigger dragons and had a ranged thu’um that shot fire at any unlucky targets. Lizinjot, “The Icy Maw”, was designed as the counterpart to Yolvolun, with capable physical stats and an ranged ice thu’um. I explained that they were young dragons who had hatched together, but had never seen any other dragons, including their parents. 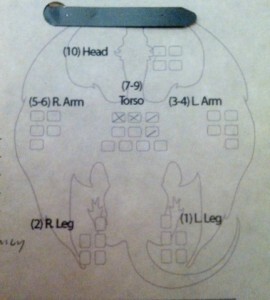 One of my important GM strategies is to leave personality information off the character sheets. Yep, I don’t tell them who they are. I specify important connections to other PCs (family relationships, similarities, past history, etc), list their stats and powers, but I let the player assemble all this information into their character’s personality. Most players are totally thrown when they sit down at one of my convention games for the first time, but I find that it actually increases the role-playing at the table. Instead of forcing a square peg into the round hole I created, the player is able to form a peg they are comfortable with and that fits in the hole that the party creates. Players are incredibly creative and come up with great ideas that would never have occurred to me. This also increases the player’s personal investment in their character and the game as a whole. Now this game could have gone one of two ways. The choice that many players would have gone with would be the majestic, wise, and ancient dragon route. My players shunned that for the more quirky, Looney Tunes meets The Three Stooges style game. They decided they were all adolescent brother dragons and immediately started beating on each other and looking for girl dragons. Yep, they rolled initiative and started wrestling in true brotherly fashio n. Although it was unplanned, it served as the perfect introduction to the Wild Talents combat system and really started the game off with a bang. The Wild Talents system ended up being a perfect fit for this game. I was able to create powers that actually matched the dragon thu’um powers in Skyrim, as well as give the dragons stats that were appropriate for their species. It also worked to create the HUGE number of NPCs that the dragons eventually fought. WOW, do six teenage dragons plow through human NPCs! As always, the players ended up really enjoying the Wild Talents combat system. I did learn that I need to color code the NPS sheets for the next time a run an overpowered game like this, to make managing the large number of them easier! Better living through office supplies!! As we moved through the story, I was absolutely floored by the level of role-playing in this game. My games are all very open, “sandbox” type worlds that encourage lots of role-playing and player empowerment, but this group took it to the next level. I was basically just along for the ride. Without pre-generated personalities to confine them, each player came up with an amazingly vibrant and unique personality for their adolescent dragon that matched perfectly with their stats and abilities. They fought with each other constantly (what else would teenage brother dragons do? ), but were also very protective of one another when danger threatened. There was never a dull moment, and watching the players revel in being the dragons and not the bite-sized humans for once was a delight. All the role-playing did take a lot of time though, and there is no time to waste in a convention game. Taking the advice of the Happy Jack’s RPG podcast crew, I had designed my game in modules to provide more flexibility in the story. There were five total parts or scenes to the story. Scenes one and three were vital to the story, but scenes two and four could be skipped if we were running short on time. I had multiple plans and NPCs prepared for the finale (scene five) so that the scene could be quickly adjusted to fit the remaining time in our convention game. This high level of flexibility takes more prep time, but it allows the game to run seamlessly during the convention and lets the players resolve the game in the allotted time. It also allows the GM to run the game again and enjoy a completely different experience. Even with all the freedom the players had in this game we ended almost exactly on time. I could tell the game was a huge success because everyone left the table as friends, and many of them were actually tweeting to each other in character for many days after. It was an amazing experience and I was truly honored that Fray, Stephen, Will, Kurt, Matt, and Sam all chose to be part of my game. They are incredible gamers and I hope to see them at my table many times in the future. If you’d like to read the play-by-play of this game from a player’s perspective, read Matt’s blog post about the it at Monkey in the Cage.